Darkfield observation in stereo microscopy requires a specialized stand that contains a reflection mirror and light-shielding plate to direct a hollow cone of illumination towards the specimen at oblique angles. The principal elements of darkfield illumination are the same for both stereo microscopes and more conventional compound (biological) microscopes, which often are equipped with complex multi-lens condenser systems. One example of a simple add-on darkfield kit for a stereo microscope is shown below. The darkfield kit drops into the stage plate position on the MW5-L5 stereo zoom microscope. Darkfield on a stereo microscope. Gemologists often use darkfield for viewing diamonds and precious stones. 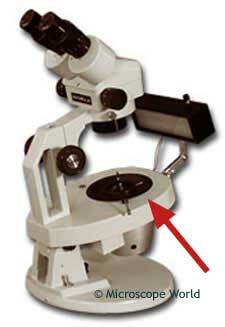 Gemology microscopes therefore typically have a darkfield feature built into the gem stereo microscope stand. 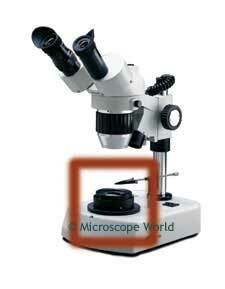 The GEMZ-5 gemology microscope shown above has an arrow pointing to the built-in darkfield unit on the microscope.